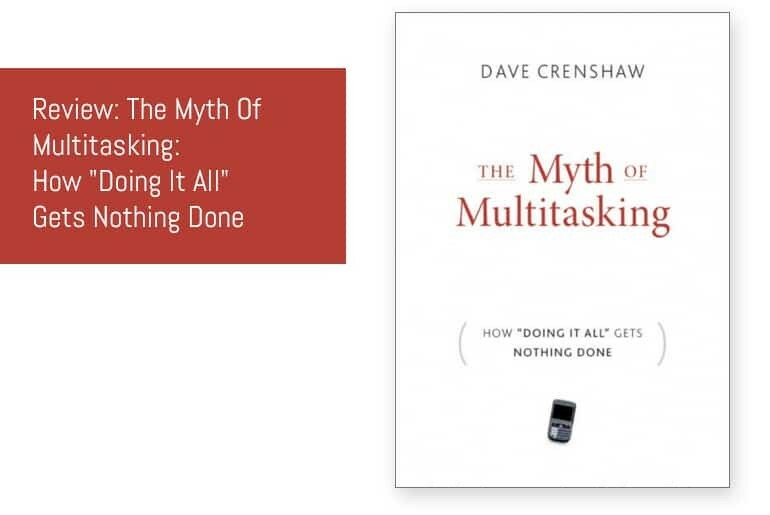 I was lucky enough to be contacted recently by the folks at Wiley Publishing asking me if I’d like a free review copy of of “The Myth Of Multitasking: How ‘Doing It All’ Gets Nothing Done“* by Dave Crenshaw. Well, you know me and free stuff so I jumped at the chance. I’d seen a few interviews with Dave Crenshaw and reviews of the book but tried not to take too much notice of them as I wanted to form my own opinion of the book so when I picked it up I didn’t really know what to expect. And I have to say I was really impressed with what I read, it certainly changes whole management book genre for the better. Unlike the usual dry style “informational” style of most management books, Crenshaw gets his points across in narrative format which is a refreshing change. The book centres around “Phil”, a time management/productivity consultant; “Helen”, a harassed business executive and “Sally”, Helen’s put-upon subordinate. Through Phil, Helen and Sally’s conversations, Crenshaw looks at multitasking and how – despite what we’re constantly told – inefficient and damaging to productivity it is. Crenshaw states that when we”re multitasking, we”re not actually working on two things at once – our attention can”t be divided that way, and he”s right. Take me for example. As I write this, I’ve also got CSI:NY playing in the background. Whilst I”m hearing it and can sort of follow what”s going on (someone”s been shot with an arrow and some other guy was killed with glue), my focus is on my laptop. All well and good right? Well, not according to Crenshaw. What I”m actually doing is what he calls “Switchtasking” – the act of constantly moving the focus of our attention from one thing to another which comes with a cost. Every time my attention switches from my laptop to the T.V, this lack of focus costs time – I forget what I was going to write, lose my place and this therefore cuts down on productivity. I”d probably have written this paragraph twice as fast if the T.V was off (mind you, I wouldn’t have written it I guess if I wasn’t watching the T.V!). According to Crenshaw there are two types of switching, Active and Passive. An Active Switch is when you actively make the switch to another task (like I just did by looking at the T.V as there was something interesting going on). Passive Switches are thing that you don”t initiate – like the email notification I just received. Crenshaw gives a nice illustration on how the cost passive and active switches mounts up; even just over the course on an hour it”s quite an astonishing amount. Instead of believing in the myth of multitasking, we should in fact be embracing “Background Tasking”. This is the act of doing something whilst we”re waiting for the another thing to finish like sending an email whilst you”re waiting for a document to print. Crenshaw provides exercises in the back of the book that were used by Phil on Helen and Sally so that you can follow in their steps and work out how much time you are losing by multitasking. The only thing I would have liked to see with these exercises is perhaps a link to a section of Crenshaw”s site where he could provide downloadable versions of the forms. The books format doesn’t really lend itself to photocopying and I think that getting people to create the forms themselves puts a barrier in between them just looking at it and actually going ahead and filling it in – I know it did me. Unfortunately, I”m not sure it can – not to a massive extent anyway. We”re so entrenched in the myth of multitasking in all parts of an organisation that it would be difficult to promote consistent changes across all areas of the business. Don”t get me wrong, I think Crenshaw’s premise is sound and that his methods really would work – I”m just not convinced it could be rolled out across a large organisation like a system such as “Getting Things Done” could (and is). This is a great book, and a really easy read – I finished it in a couple of lunch hours. It’s well written and contains some great information and stats – although I did find the pull quotes a bit distracting. Would I recommend it? Yes, for smaller organisations and individuals I think it would have a big impact on productivity and work/life balance. If you”re interested in finding out more, you can visit Dave Crenshaw’s site or buy The Myth of Multitasking: How ‘Doing It All’ Gets Nothing Done* at Amazon (affiliate link). « Move over Entourage, Here comes Apple Mail!